The people of Taiwan have elected Ms Tsai Ing-wen as their first female President. For the past eight years, Taiwan has been governed by the Kuomintang, a China-friendly party. Tsai Ing-wen and her party, the Democratic Progressive Party, have a more progressive approach to relations with China and see Taiwan rather as a separate country with its own role in the world. Nonetheless, Ms Tsai reassured her people that she is going to maintain the status quo with its larger neighbour, emphasizing that both sides have a reciprocal responsibility to interact. Voters concerned that Taiwan's economy is under threat from China and broadly opposed to Beijing's demands for political unification resoundingly chose Tsai over the Nationalists' Eric Chu, a late replacement in the campaign after his party's original candidate was seen as alienating voters. Tsai said her victory was a further show of how ingrained democracy has become on Taiwan and showed that its people wish for a government "steadfast in protecting this nation's sovereignty." She too pledged to maintain the status quo with China. She said both sides have a responsibility to find a mutually acceptable means of interacting, while adding that Taiwan's international space must be respected. She said she would correct the policy mistakes of the past, but warned that: "The challenges that Taiwan faces will not disappear in one day." Chu conceded the massive loss and resigned from his party's leadership to take responsibility. Outgoing President Ma Ying-jeou is constitutionally barred from another term. By Saturday night, Tsai had more than 56 percent of votes counted and Chu had 31 percent, with a third-party candidate trailing in the distance. Making Tsai's task easier, her Democratic Progressive Party won 68 seats in the 113-seat national legislature that has been traditionally dominated by the Nationalists, who took home 36 with the remainder going to independents and smaller parties. Illustrating the extent of their defeat, the Nationalists had won 64 seats four years ago. The new legislature convenes next month while Tsai is set to be inaugurated in May. 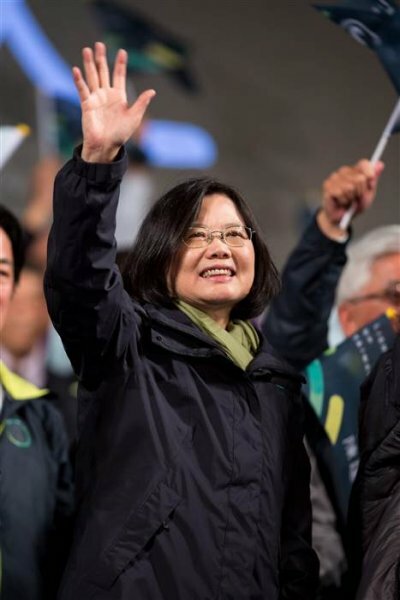 The United States, Taiwan's most important ally and source of defensive arms, congratulated Tsai on her victory. "We share with the Taiwan people a profound interest in the continuation of cross-Strait peace and stability," State Department spokesman John Kirby said in a written statement. Tsai said one of her top priorities would be to unite Taiwan in order to gain strength and respect from international society. "Only when we grow stronger will we be able to gain respect and protect our people and our democratic way of life," Tsai said, referring to Taiwan by its official name, the Republic of China. Addressing a thin crowd of a few hundred supporters at his campaign headquarters, the Nationalists' Chu said: "We failed. The Nationalist Party lost the elections. We didn't work hard enough." He followed his concession speech by taking a long bow.